Why should I flag a flashcard? 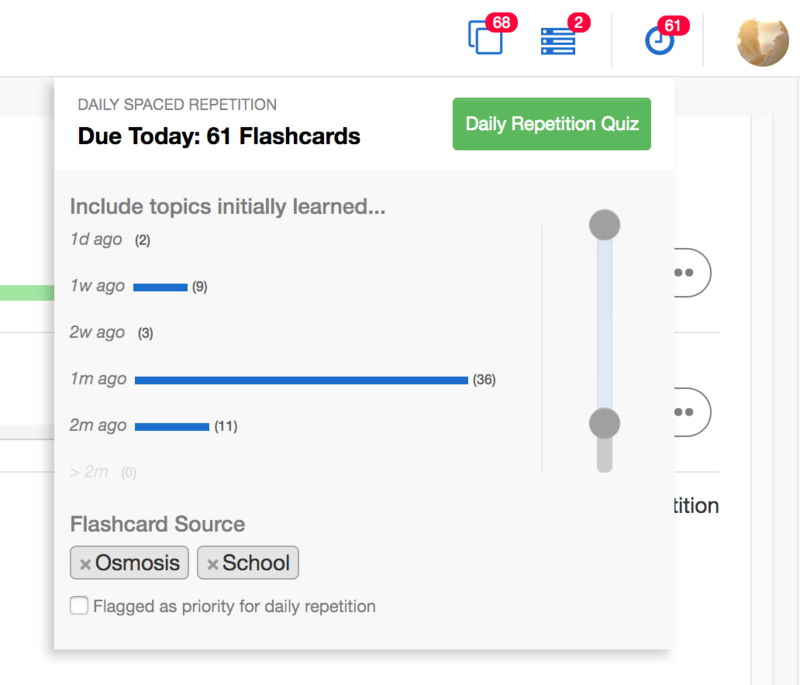 Flagging flashcards help you to prioritize the cards that go in your Daily Spaced Repetition. It does not affect the algorithm, it just helps you prioritize when you are short on time. We automatically flag flashcards when we are confident you want to see the card again with high priority. We do not automatically flag the flashcard for you when you may not have had a chance to review or preview the quality of the card. You can flag (blue) for high priority or unflag (gray flag) for low priority by clicking on the flag. Alternatively, if you do not want to see this card again, you can remove it from your queue (it won't be deleted from the platform) by clicking the "Do not repeat" button. Note: The easiest way to test do not repeat is to go to "See All" in your flashcard queue and start one of the groups listed there. Then hit do not repeat for an item and go back and refresh the page. The total number of questions for that deck should decrease. 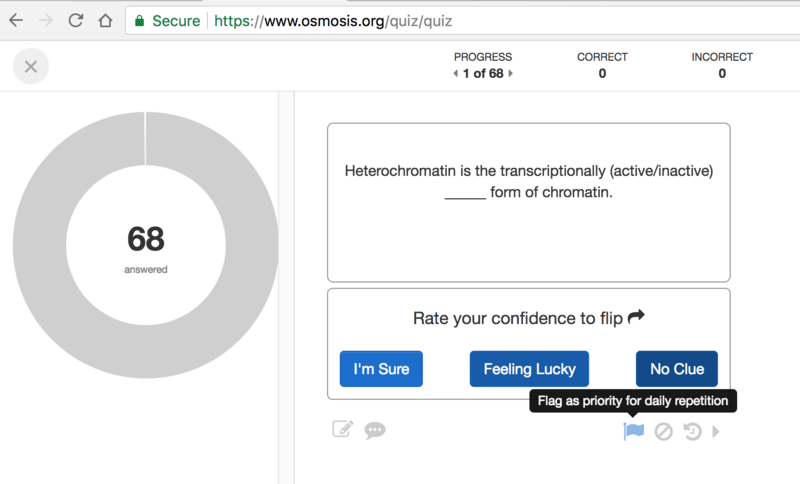 Inside a quiz accessed from Saved Flashcard queue. If the flashcards were accessed from basically anywhere besides your Saved Flashcard queue they are not automatically flagged as a priority (gray flag). If you want to prioritize cards access from Quiz by Calendar, you will need to flag them. You can prioritize your spaced repetition queue by selecting "Flagged as priority for daily repetition". This will leave out the low priority flagged questions. 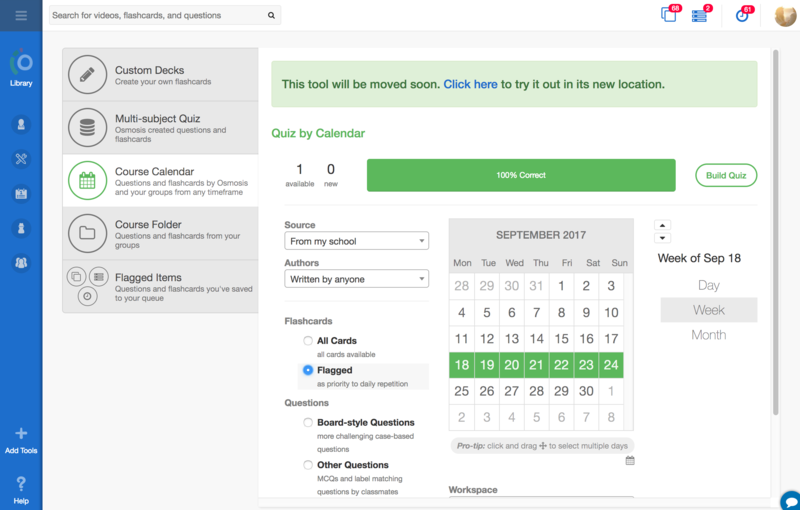 You can reorganize your flashcard history by promoting groups of flashcards or questions to the top of your queue. Basically, this just re-saves to the queue. Anything promoted to the top becomes a part of the red 'added just now badge' in your queue.